In aid of the St Michael the Archangel, Kirkby Malham, Restoration Campaign, a limited, second edition of this very scarce local history of Kirkby Malhamdale has beeen published by Kirkby Malham PCC. 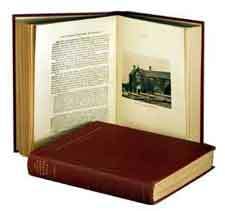 The whole edition is limited to only 250 numbered copies and has been printed by Smith Settle of Otley, who specialise in high quality book reproductions and craft bindings. Written by the late John William Morkill of Newfield Hall,it is a well researched book which has stood the test of time due to the authors painstaking research using original documents. From before Domesday to the mid 19th Century, the text is packed with information extracted from deeds, manor rolls, parish records and other documents, plus material on the major families of the Dale. It should prove fascinating to those with Malhamdale connections or an interest in the local history of Craven and become a collectors item in its own right. Maroon cloth covered boards with gold blocked titles as illustrated, plus a reproduction of the original and rare dust jacket. Click the link below to see the order for and price list.